Not surprisingly, the Unionists were outraged at this governmental alteration. 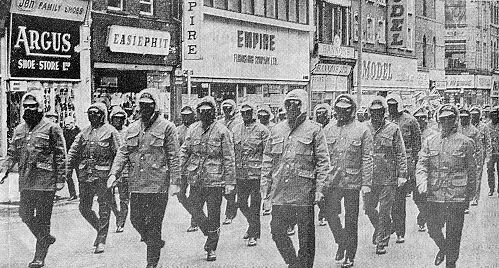 A strike slowly began to emerge when the unheard-of Ulster Workers Council (UWC), a compilation of trade Unionists and Protestant industrial workers, declared a labor strike in May 1974. No big named organizations or politicians endorsed them. This all changed when the Ulster Defense Association (UDA) took charge and began orchestrating mass demonstrations. They convinced and coerced workers to strike from jobs, created road blocks, and dispatched masked men to shutdown factories.6 By the first day, the port of Larne was sealed off and entry into Belfast was blocked off. Within days, Northern Ireland experienced severe shortages of food, electricity, and basic necessities.7 Unlike the previous VUPP Strike, the UWC strike was successful after two weeks of protesting. The Catholic factions in the government, SDLP, agreed to suspend the Council of Ireland and most importantly, the power sharing agreement was destroyed when Chief Executive, Faulkner resigned to protest with the strikers.8 This strike served to set an example (hoped for achievement) for future strikers.